Making money blogging has been the dream target of virtually all bloggers these days, but quite lots of them have found themselves outside the financial blogger zones. I started blogging like 5 years ago, and for good 3 years I couldn’t make a dime with the blog. Not that I never had passion for blogging, nor updating my blog regularly, but I lack the power to go premium in everything I did concerning the blog. The right time for you to make blogging a business has come because you need to spend to earn. I always have this “free” mentally, but when I changed and started using paid and premium tools, my online income increased by 200%, and I started getting huge Daily visit. 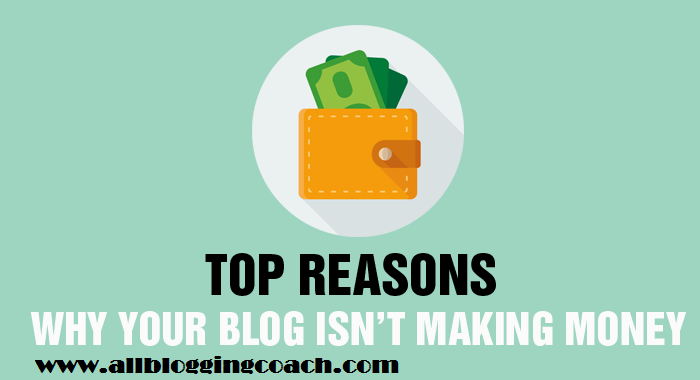 However, to make this post short and straight to the key points, I’ll be talking on the Top 10 Reasons why you are and have not started making money with your blog. Think about your favorite blog. How often is the blog updated? I’d venture to guess that it is updated at regular intervals – whether it is three times per day or three times per week. If you visited the blog one day and it didn’t have new content, when it should have, you’d start to wonder what was going on. If you visited again for the next few days and there was still no new content, you might start spreading out the time between your visits. On the extreme end you might even forget about the blog and never visit it again. One of the biggest reasons why a blog doesn’t make a dime is that it isn’t updated regularly. You demand fresh and new content from the blogs you frequent and so you should assume that visitors to your blog have the same expectations. You want to keep visitors coming back to your blog with regularly updated content. Oh! You want to make money with your blog? But you have forgotten that it is only little drops of rain that fills the bucket. You hate Google, you hate Yahoo and you hate all those search engines, you just don’t like them. You are human, so why should you be working for robots. You are not deceiving me, but are only deceiving yourself. Try to learn SEO and use it to your benefit, you will love yourself for it. If you want to be a professional blogger, you need a professional site. Consider getting a domain for your site and replacing your present template with a more professional, attractive design. If your blog looks cheesy, some people may question whether they can trust your advice. You might dream of creating a blog to replace your full-time income; and although challenging, it’s possible. But you’ll need to understand what it takes to create a profitable blog. What other reasons prevent a blog from earning money? I am a life exam of experiencing 70% increase in my daily visit when I changed my blog design. Lots of people commented and appreciated the design, some now came and asking if they could advertised whereas others wanted to guest post. These are what professional design could make and get for you. You might have great content that people love, that makes your reader gig, But if you don’t give folks an effortless way to share the content with their friends, that content won’t live up to its full potential. Be sure to include relevant sharing buttons for your audience. Got this video that shows you the most popular social sharing options, and I believed it will be very useful for you guys. According to research, it was discovered that 80% of people who visit your blog are first-timers, you want to know why? Read (source). That means only 20% are returning! If you want people to return, you need to encourage them to do so. Like “We offer people a free video tutorial or we give people pdfs on how to make money online” if you sign up for our email updates. We also employ social proof by showing how many people are on our subscriber list. Things like these really make readers to believe in you, and they will want to subscribe to your newsletter to learn more. i believed you have learnt one or two things from this listed point above. We both know that the list are endless and you also have observation and point you’ll like to add. Please kindly use the comment section to commend us on this post or perhaps, share your own view on this topic. Don’t just go after reading this point. Drop a comment. In anticipation, we also thank you for sharing this post with your friends and followers on social media. We Love you. I am totally agreed with this and number 4/5 are key things we should take care of to get more readers and make money.